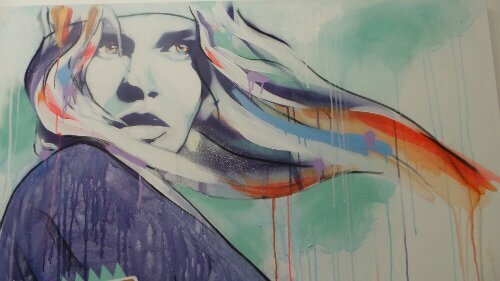 Whitecross Street has a vibe all of it’s own! Not quite the city and not quite within the cool conurbations of Shoreditch and Hoxton, it has a special relaxed atmosphere. 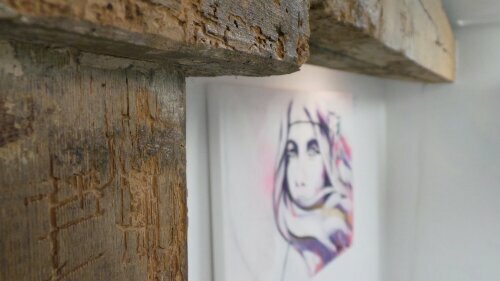 Off the beaten track but easy to reach it is a place for artists and art afficionados to enjoy, hosting as it does the popular Whitecross Street Party, the art of which still graces the walls of the street in a kind of Outdoor Gallery. It is perhaps no suprise then that one of the most innovative gallery spaces in the City of London has chosen to call Whitecross Street home. 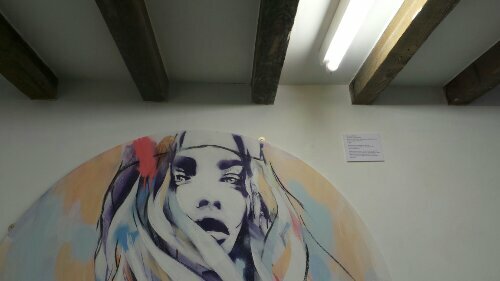 The Curious Duke Gallery, only founded two years ago by Curator Eleni Duke, has forged a reputation for promoting new talent, encouraging innovation and providing one of the most unique spaces for gallery exhibition around. Already the Curious Duke has been able to establish an enviable array of talent with which to work and promote. The current exhibition ‘Through the Minds Eye’ by Hannah Adamaszek has been keenly anticipated by art lovers and the Gallery provides the sort of canvas which is both intimate and spacious at the same time. The building itself is unique, over 300 hundred years old and a former bakery, it survived the blitz when so many other buildings around it did not. Inside an intimate corridor leads to stairs which then guides the visitor downstairs into a basement which still boasts it’s original timber beams. It is here where the gallery opens up and the Curious Duke makes good use of the number of walls at it’s disposal, 23 in all because of it’s unique design. “It was like a big hug” says Eleni, reflecting on the time she first saw the building that would become the Curious Duke, “It had so much character and personality… It doesn’t feel like a closed white space, it feels like this cosy, welcoming space where you have to explore the building in order to see the artwork.” The fate it would seem of this former bakery and blitz survivor was sealed and a gallery was born. Eleni completed an internship at Oxford House in Bethnal Green where she curated shows in a building which area wise was quite similar to that of the Curious Duke. She learned valuable experience there prior to a period travelling abroad. 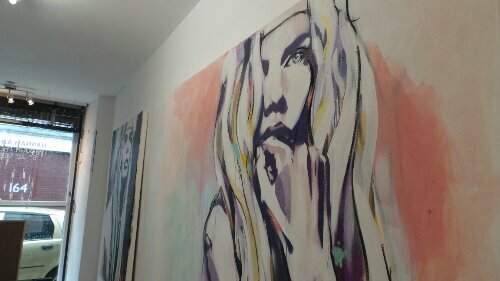 Coming back to the UK, a hard time economically for the country and the arts meant that finding work proved challenging and so she took the plunge and set up what was meant to be just a temporary pop up gallery on Whitecross Street. After putting on four shows in three months she decided to turn the gallery into something more permanent and the Curious Duke Gallery was born “it was probably the scariest thing I’ve ever done in my life, but I’ve never looked back it’s been fantastic” she beams. Speaking about the type of work she exhibits in the gallery she describes it as “primarily surrealist but with a bit of an edge and quite urban… I like to go with new concepts, new styles, well executed work, something that I’ve never seen before and something that I would like to have in my own home”. 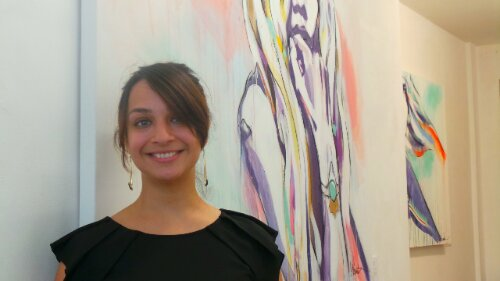 As a new gallery she also likes to work with new artists often forming close bonds with them and is in regular content with all of the artists her gallery exhibits. “It’s nice to be working with up and coming artists as an up and coming gallery because we know what is going through each-others minds and so are able to support each other and work together to reach an end goal with is really beneficial to all of us.” It seems to be a business model which works as the Curious Duke currently has an array of talent including the likes of Andrea Tyrimos, Kef and Nathan Bowen. It’s clear that ‘Through the Mind’s Eye’ is a show which Eleni is at the same time passionate and proud of! “I think Hannah’s work has the ability to change the emotion of a space” she says. “We can give the viewer different feelings as they walk around the gallery and I just think that (Hannahs work) fits the space so well and it fits the ethos of the gallery, it’s beauty, it’s quality and uniqueness all in one”. 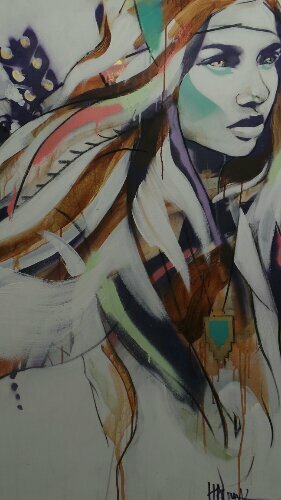 Her personal favourite, a piece called Wildfire which portrays a woman with a bow and arrow on her back looking out into the distance. “She’s just got this fighting spirit, she’s got this bow and arrow on her back and it’s like Hannah’s characters are all quite vulnerable but have this incredible warrior spirit about them. You never know where they’re going but they are really inspiring images. I just love Wildfire, I love them all”. 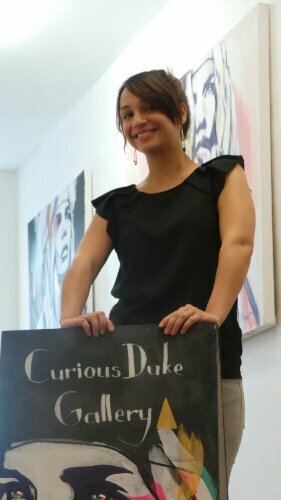 As for the name Curious Duke, Eleni says it just comes down to what her views are on what art should be “Everything that we hang has to have an air of question behind it! Like the viewer has to question it and I think that’s what intrigues people and that’s what you want from art, you want to say I’ve never seen anything like that before that’s fantastic, how did she do that or how did they do that. I think all art should be curious” she says, “I think it should spark curiosity”. Eleni Duke was interviewed at the Curious Duke Gallery on 8th September 2013. 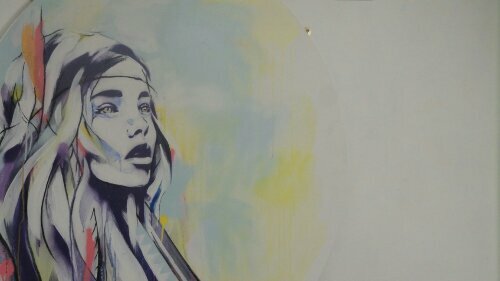 The Gallery is situated on 207 Whitecross Street in London and is currently exhibiting ‘Through the Minds Eye’ by Hannah Adamaszek, a show which lasts until 21st September 2013. The website for the gallery is www.curiousdukegallery.com. Whitecross Street Party 2013 – Rise of the Non-Conformists.